Running coupling reactions in solution-phase lowers solvent waste, increases coupling efficiency, results in high crude purities, and ultimately reduces total cost. GAP synthesis deliver savings without sacrificing quality. Eliminating SPPS resins, GAP reactions optimize available space, synthesizing larger quantities in smaller reactors. Coupling reactions conveniently run at room temperature and resulting high crude purities can reduce LC time, facilitating fast turn-around. GAP peptides are synthesized using state-of-the-art equipment and checked for identity and purity with both mass spectrometry (MS) and liquid chromatography (uHPLC) by an independent 3rd party. A CoA accompanies every order. GAP Peptides LLC leverages the science behind GAP chemistry to enable chemical synthesize of synthetic peptides at commercial scales. 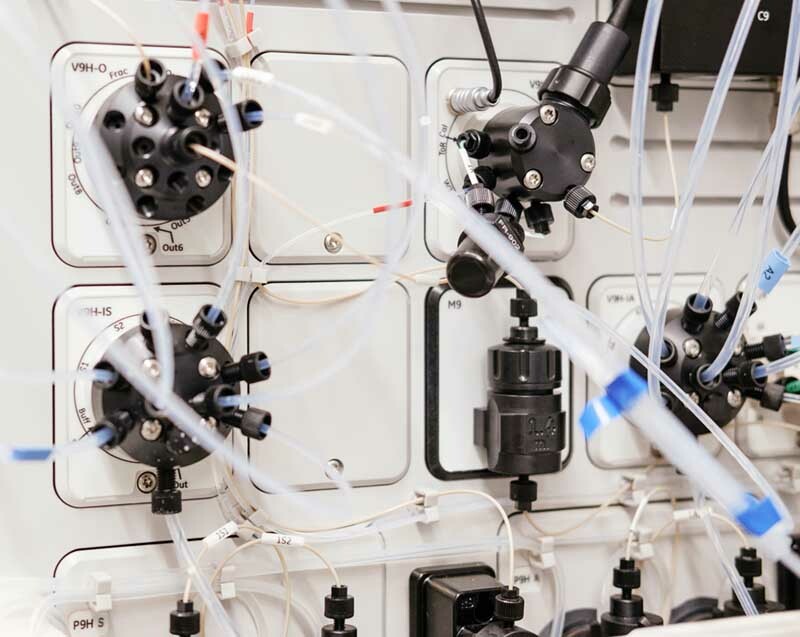 We use solution-phase, Fmoc/tBu synthesis methods and incorporate our proprietary IP to deliver the capability of producing milligrams to kilograms of high-purity peptides for research. The novel approach we apply to peptide synthesis is intensely practical. Our process reduces the amount of raw materials consumed, lowers expensive equipment utilization, and minimizes waste by-products. With the use of green solvents, GAP Peptide Synthesis (GAP-PS) technology improves the ease and safety of reaction conditions while simplifying the operations needed for intermediate purification. GAP Peptides Synthesis (GAP-PS) delivers substantial economic advantages affording the production of synthetic peptides at lower costs than traditional chemical synthesis methods. Our research services provide the evidence needed to show that GAP-PS results in shorter production times, lower overall costs, and high-purity crude peptides. Contact us to learn more. Submit a request for quote here OR contact us at info@gappeptides.com. For faster response, call 806-553-2114. Throughout the manufacturing process, updates will be provided if any foreseeable changes occur to the quoted delivery timeline.